1 Combine beef, Knorr® Vegetable Dry Soup Mix, 2 Tbsp (30 mL) water and Italian seasoning in medium bowl. Shape into 12 sausage shapes. Chill 30 minutes. 2 Grill, turning once, until done, about 8 minutes. 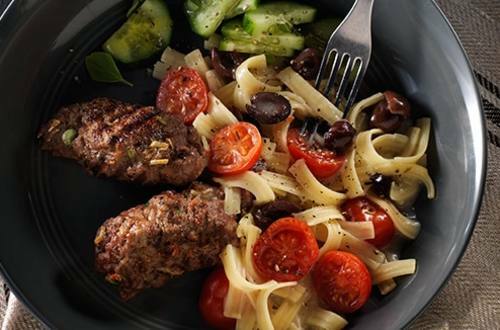 3 Prepare Knorr® Sidekicks® Butter & Herb Pasta Side Dish according to package directions, adding tomatoes and olives during last 2 minutes of cook time. TIP: Serve with grilled vegetables or a Greek-style salad. Each serving of this dish provides ½ serving of vegetables and is a good source of iron.